Whatever your project, Cheaper Than A Skip Derby can save you the time, hassle and cost of getting rid of your unwanted items. We can clear out anything from a single bulky item to an entire house and we guarantee that our prices will be cheaper than hiring a skip, plus it saves you having to do all the lifting and carrying yourself. For a free quote, contact us today. We'll happily come and see you, look at what you need and give you free, friendly advice and a no-obligation quote for the work you require. "Really pleased with your service. Saves me so much hassle clearing out our garden. Thank you!" "Thanks for saving me a big job on getting rid of our old garage. Saved me having to do all the lifting and was definitely cheaper than getting a skip." We're the people to call if you need help with house clearances in Derby or are looking to tidy up your outdoor spaces with a garden clearance or outbuilding demolition such as a shed, garage or greenhouse. 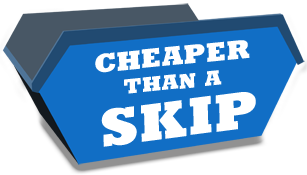 As our name suggests, we guarantee to be cheaper then any skip hire in Derby (for like for like rubbish removal quantities) AND we do all the lifting and carrying for you too - saving you both money, time and effort! 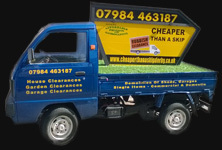 Contact the Cheaper Than A Skip team today for a completely free, no-obligation quote on your clearance project. We'll offer you free, friendly advice along with a quote for the work you require, even coming out to take a look at the job required if necessary. Give us a call or send us an email and we'll be happy to help. We also offer fencing services in Derby via our sister company, Affordable Fencing Derby.